Spotify Mobile is most popular on the iPhone, but the excellent Android version (which basks in a 4.5 out of 5 star rating in the Android Market) is quickly catching up — which reflects the growing number of Android converts across the globe. 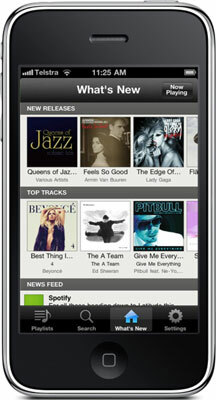 It wasn’t always the case, but today, both Spotify for iPhone and Spotify for Android enjoy similar features. Spotify tells me that the greatest differences between the apps on the various devices mainly involve the user interface — the way you navigate various functions. It’s like using a different web browser or e-mail program to perform the same kind of action. 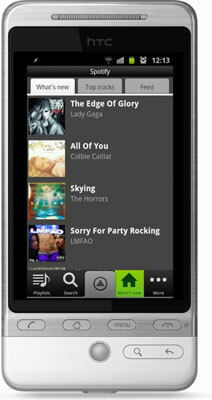 You’re restricted to using the version of Spotify Mobile that’s designed to work with your handset. As you can see, they look a bit different, but the functions are very similar. New cellphones, smartphones, and other mobile devices are cropping up all the time, but there should be a version of Spotify Mobile that’s compatible with most mainstream handsets. One obvious omission is the BlackBerry —Spotify is listening to its customers when it decides which platforms to support, but it’s very tight-lipped when it comes to product announcements.